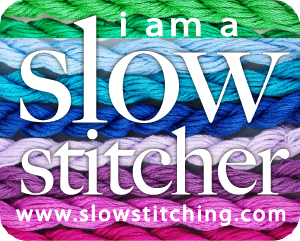 While attending Spring Quilt Market in Minneapolis last May, I began to hear about The Slow Stitching Movement. Intrigued, I set out to learn more. I have to say that once I began to learn what this is all about, it resonated very strongly in my heart. This is something I truly believe in!! What exactly is The Slow Stitching Movement? Mark Lipinski is at the very heart of this movement, and through this movement is making us aware to slow down....enjoy your stitching, and take pleasure in what you're doing. 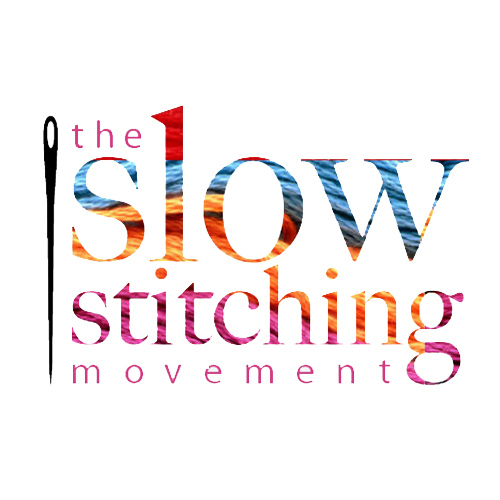 The Slow Stitching Movement doesn't only apply to quilting and piecing...it applies to all of the needle arts whether your passion is to knit, crochet, cross stitch, rug hook...whatever the stitch. The reason I truly believe in this movement, and I wanted to share this on my blog with you is because I feel we're all in too much of a hurry to quickly get one quilt done only to start another. And while there are definitely projects that are and need to be made that way, in my humble opinion, there are way more that should be enjoyed slowly, taking in the sheer pleasure of skill with hand, needle, thread and fabric...all while you make something lovely and lasting. 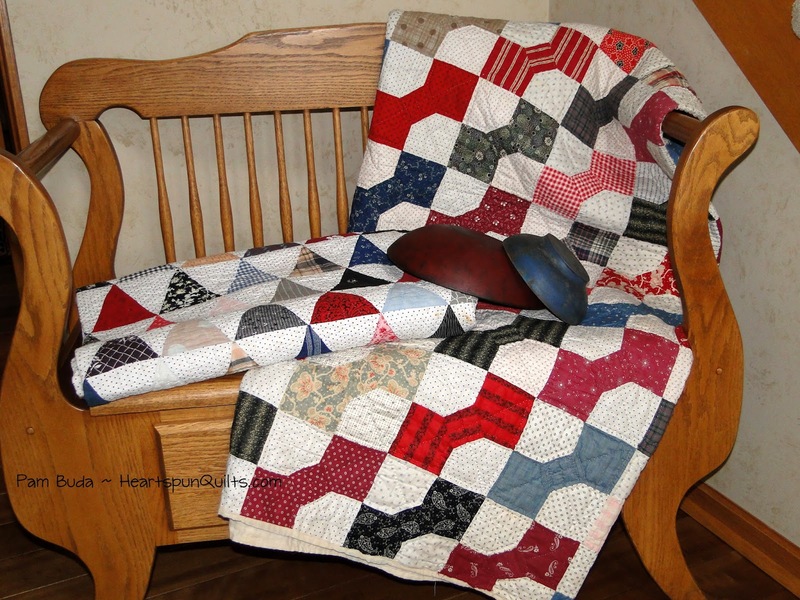 The quilt at the left is an glorious antique that I own and is a perfect example of a quilt that was slow stitched. Its many pieces were no doubt cut by hand, and it was definitely pieced and quilted by hand. Am I saying that I think we should go "old-school" and piece in the purist style from now on? Heck no! I'm not abandoning my rotary supplies or my BFF Bernina!! I'm just saying that if quick and call it done were the only quilts we piece, even two hundred years ago, this glorious quilt would have never been made. It took well over a year (on and off) to piece. It has thousands of little bits of paper pieced fabric worked into the Churn Dash blocks. 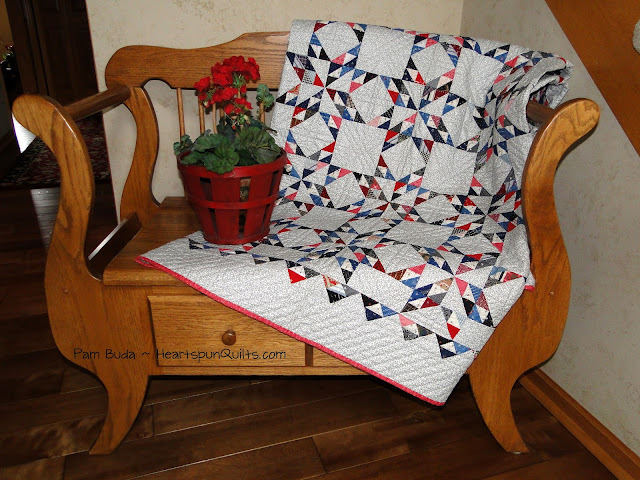 I enjoyed the entire process of making that quilt, choosing just the right mix of fabrics in each strip. Those of you making a Dear Jane quilt have already signed up to The Slow Stitching Movement because that glorious quilt takes some time and skill, to say the least! 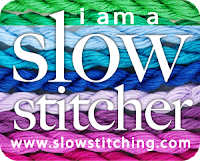 And, that brings me to another reason The Slow Stitching Movement resonates with me. Skill. The movement strongly encourages you to build your piecing skills. Learn and master new techniques and take pride in your work! As often as time allows, I try techniques I've never done, such as curved piecing and mitered borders. I'm a novice at needle-turn applique and am loving it. It wasn't so long ago that I thought applique was a four-letter word! 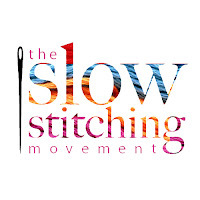 The Slow Stitching Movement blog ~ describing what it's all about. Presently, I am working on several quilts that I've designed and am taking my sweet 'ol time making. I ponder the fabric choices for each block and piece to the best of my ability. I'm thoroughly enjoying the process. Time is not part of the equation at all. I love and embrace the challenge! And when these quilts are complete, I know my heart will fill with satisfaction knowing I gave it my best, and all the stitches hold tiny parts of me....each slowly stitched with love. 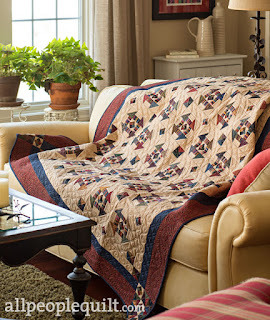 This marks the half-way point of our Prairie Gathering Quilt of the Quarter piecing journey. Hard to believe that we've come this far already! This month isn't going to be exciting, I'm afraid. 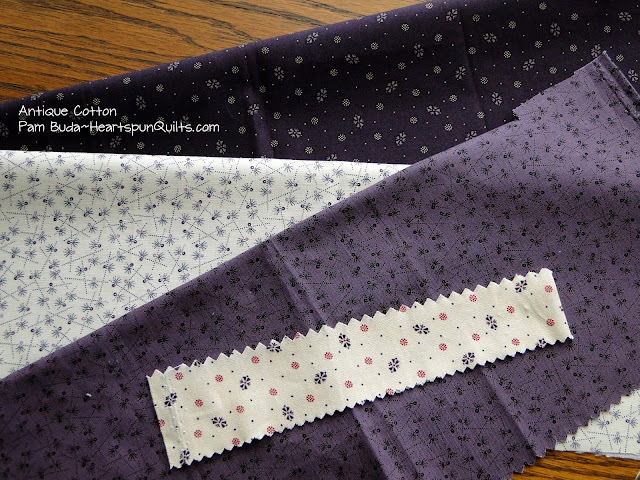 Like last month, we're deep into piecing lots of the same units, and cutting fabric, and saving for later. Does that sound like drudgery to you? I know it can be, but sometimes, this is my favorite kind of piecing because I've done it all before, so don't have to think too much about it. It's the perfect piecing to watch a movie by, or listen to a good book because you're just sending the units through the machine. Right now, that sounds like heaven to me! Take comfort this month in this easy, done-it-before piecing assignment because things are going to really change next month! And you'll be piecing your little heart out from here on, making this quilt sing border by border!! Hesitant to sound like a broken record, but I must remind you to measure, measure, measure. You'll benefit in a big way next month when your units all measure what they should. I'll be coaching you through my best tips on accurate pieced borders next month. When the heat and/or humidity (which is how it is where I live) become too much for you, spend some time sewing and watching a good summer movie, and just enjoy this piecing journey. There really is so much pleasure to be had in taking your time with piecing, and soak in the beauty of your work. That's is, after all, what its all about! Let's not rush through it. If you'd like, click here to see my previous piecing hints for these units. 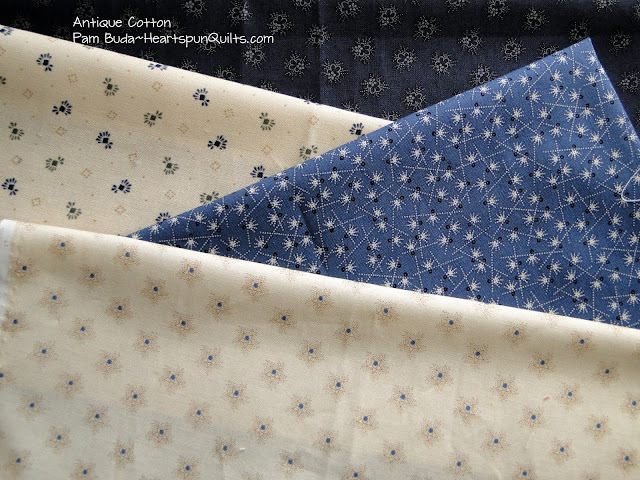 There's just something about antique cotton that makes my heart sing. It's ultra soft. I love the crinkle of well washed cotton. It feels so lived-in and cozy. These gorgeous quilts full of scraps were likely utilitarian, put to daily use. When they were made, they may not have won ribbons at the County Fair, or grace the bed for a guest, but that's alright with me because they were love worn. 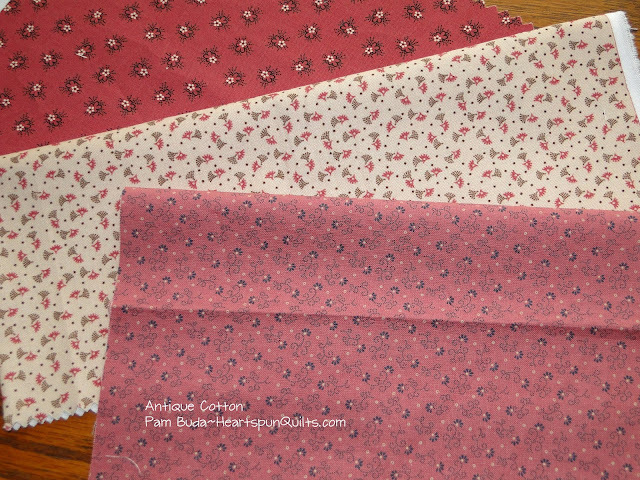 These quilts, and others like them, were the inspiration for my newest fabric collection, called Antique Cotton, for Marcus Fabrics. The prints I chose are small, little calicoes and shirtings I found in many of my antique quilts. The big quilt I am making from this collection were inspired by these quilts without focal borders. The prints, and the block and quilt design are the focus! There are prints in seven colors and a wide variety of shirtings. I had a lot of fun playing with the colors in the shirtings, and matching them with different combinations of the darker prints. 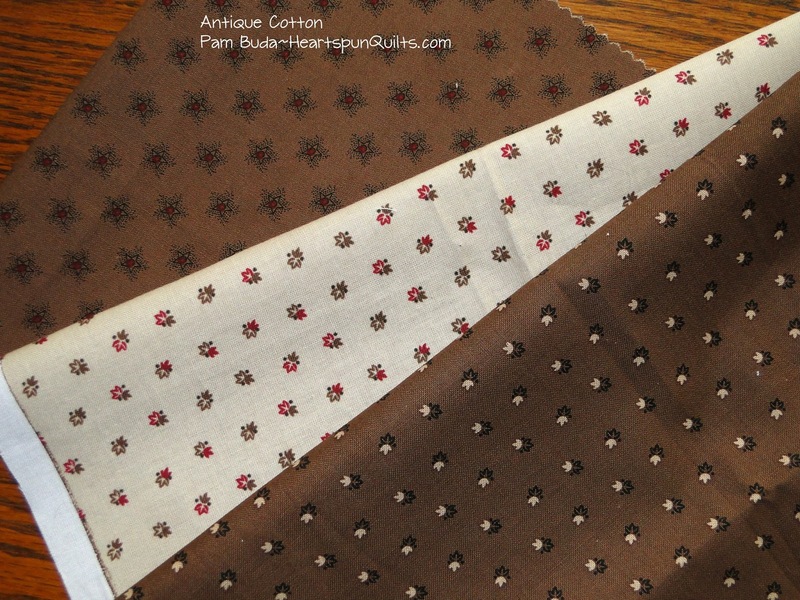 It's a great mix and match line, and will certain be fun to add to your stash and scrap quilts. 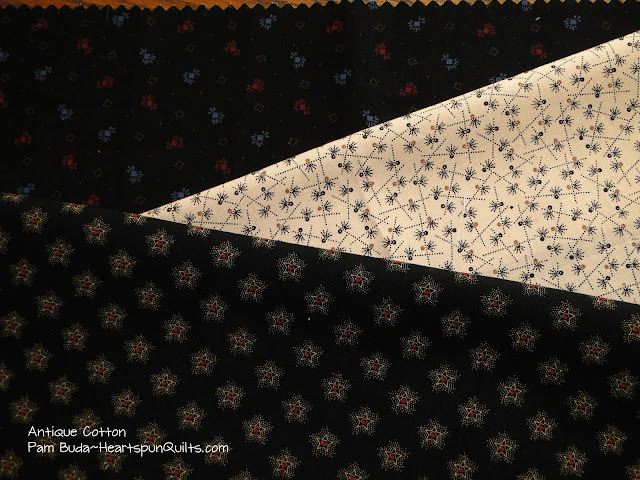 Click here to visit the Marcus Fabrics blog and see more photos of my antique quilt inspirations and lots of other good stuff. 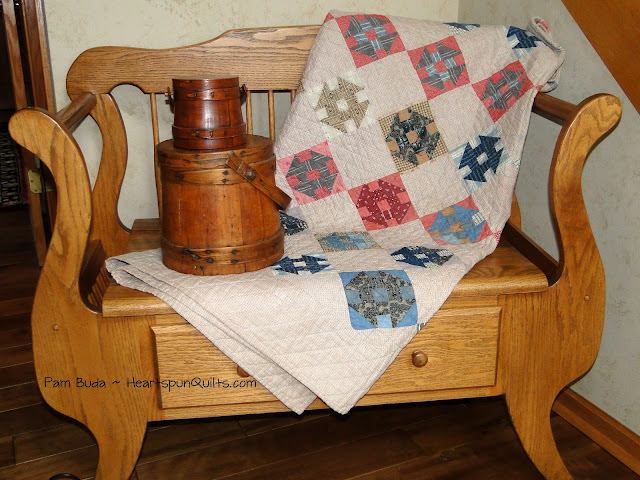 Watch my Instagram and Facebook posts to see sneak peeks of the quilts made from Antique Cotton. P.S. 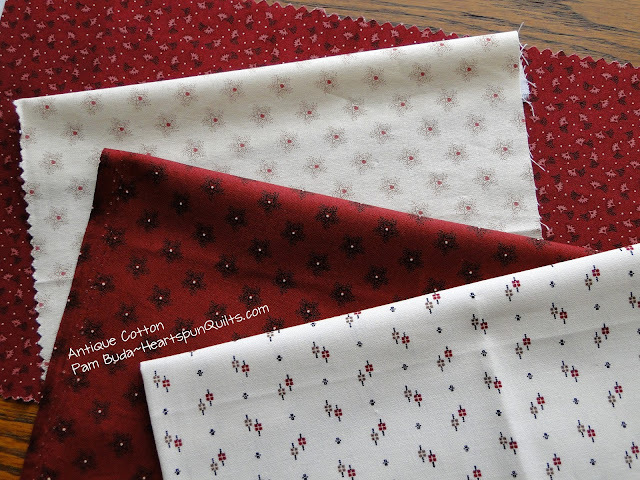 My next Prairie Gathering Quilt of the Quarter blog will post Monday, June 22nd. I thought you might like to see the eye candy work of other quilters for a change. I made the quilt block pictured above, and it was an orphan, leftover from when I was making my Every Little Bit quilt featured in American Patchwork & Quilting magazine (June 2015 issue). I offered a couple of these orphan blocks in a blog raffle when the magazine came out, and Barbara Leyland was one of the winners. She recently sent me this photo of how she framed the block, and I thought it looked really great, and wanted to share her idea with all of you. Love, love the wormed wood frame! Great job, Barb....and thanks for sending he photo for all of us to enjoy!! Last weekend, I had the pleasure of traveling to the Haubstadt, IN area to the quilt show put on by Quilts 'N Blooms Quilt Shop. Shop owner, Kathy Will, her family, and lots of friendly helpers created an outstanding event. And the surprises when on from there as I couldn't believe how many of the quilts I have designed were hanging in the show!! What a thrill!! These talented bunch of ladies had numerous over-the-moon quilts in the show. Here are just a few of my favorites. The Farmer's Wife...on my bucket list. Dear Jane. She's been on my bucket list for a long time now. Sigh...one of these days! 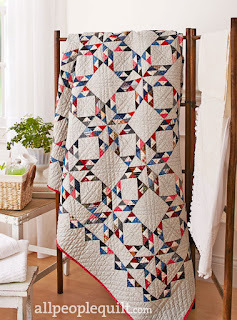 If you're a regular reader of my blog, you know how I L*O*V*E mini quilts and blocks. This extraordinary collection of quilt work was all hand pieced, hand quilted and all using vintage fabrics from a very talented quilter by the name of Sheila Holland. I was in total awe. Honestly, these were but a few of the many beautiful quilts on display at the quilt show. I wish I could have shown them all and named each quilter, but time just does not allow for that. I hope you enjoyed seeing these quilts, and they inspired you the way they did me. Have you heard of The Maker Movement? If not, you have now, and awareness is growing each and every day! You're a part of the Maker Movement whether you know it or not! If you're not familiar, you're a "maker" simply because you make something. Being a "maker" is an umbrella term for just about anything and everything we create with our hands, tools and creative talent. It's a national movement that encompasses everything from DIY-ers who work on their homes to those who tinker building robots. You happen to be a "maker" in the textile end of the spectrum. You might say the original makers were our ancestors, whom in eighteenth and nineteenth century American made a great deal of just about anything needed for their homes and businesses. From wood, they made any number of household items (treenware) like buckets, furkins, cutting boards, spoons, plates, bowels, etc. They spun and wove threads for fabric, made their own clothes, grew their food....you get the idea. They made whatever they needed. Out of necessity, they invented so many things, and were the truest Folk Artists. This way of living and creating is what The Maker Movement is all about, reborn in twenty-first century America, and is including many of the new things we live with everyday. Click here to read an article from Time magazine all about The Maker Movement. As promised, let's take a little walk away from my booth, down the aisle at market. Paula Barnes took this photo of our neighboring booths with her smart phone. Took a great photo, and the camera 'bent' the floor so it looks like we're on a corner, but that's an illusion. Kinda cool, huh?!! First stop is, of course, to Red Crinoline Quilts and Paula Barnes' booth. The purple quilt hanging on the wall is called Davenport made from her new collection, Davenport Gardens. On the drying rack is one of my favs, Bonnie Blue. I'm madly in love with the quilt on the wall called Blue & Gray. It is just stunning, and I love the stripe border. I pined for this quilt the entire weekend. This adorable little quilt is called Union Tents and is made from one 10" precut pack of Paula's Historic Stripes collection. So sweet and simple. Don't ya love the vintage photo she had with it?!! This is a new version of their pattern, Sherman's March. And a new version of their pattern Old Abe. Click here to shop at Red Crinoline Quilts website. Next stop is to fellow Marcus Fabrics designer, Nancy Rink. This beauty is Country Crossroads Block of the Month. eye candy. 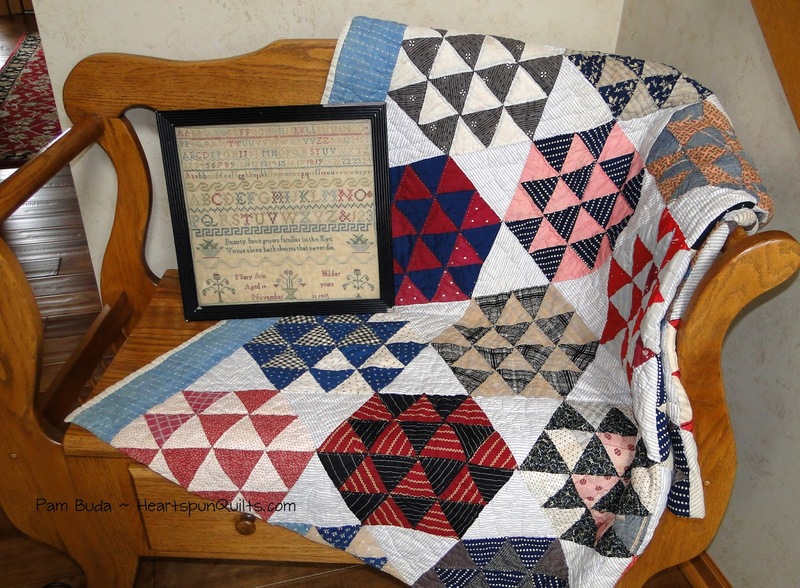 These are the quilts from her Amish With A Twist BOM series, with her third in the series coming soon!! Click here to see all of Nancy's quilts. Doesn't this display just take you Farmhouse living? All of the projects in this lovely display are from a new Marcus fabric line, Farmhouse Blooms, by my friends Gloria Parsons, & Vicky Iannucci of Olde Green Cupboard. They grew up with this now vintage look, and do it so very well, don't ya think?? All of the new introduction items in the remaining photos above are coming soon from all of the talented people at Marcus Fabrics. Click here to browse to your hearts content! At the end of my aisle, my pal Stacy West of Buttermilk Basin had a jaw dropping display of new work. So much to see, my eyes wouldn't stop darting from place to place!! I adore red pick-up trucks at Christmastime, and had to have the little tree and truck quilt on the wall called Vintage Tree Farm. Don't you want it all?!! I'll just let you eyes peruse all the goodness. Stacy's new monthly wool projects, called Simply Words, was another favorite I just had to have. So sweet, so simple, and do-able. I think I might be able to fit one in now and then, for my 'work with wool' fix! Click here to shop at Buttermilk Basin's website. That was a far as I was able to go with my camera. I was able to see more things here and there by going to the convention hall early in the morning, but if the designer was not in her booth, I was unable to ask permission to take photos. Trust me, there's a whole lot of wonderful coming to your local quilt shop! So, clean and oil your machine, by a new package of sewing needles, and get ready to sew. It's gonna be a fun summer! !